Note: In the protocol section, you should select SFTP if your hosting provider supports it. Hello! Not sure if you have made a post about it before, but I’m wondering about what to do if you close yourself out of wordpress dash. I once made changes to a file within wp dash editor and i could’nt access it anymore, it also left my site with an error. For that I had to contact my hosting provider. If something happens where not even the hosting company can help access wp dash again, is there something specific we would have to do? Please see our article on what to do when you are locked out of WordPress admin area. Hey your post is really fantastic and useful. but what i need to know is in my case I am not trying to upload a plugin or a theme. I am trying to upload a couple pages together in a folder that can be opened directly with a URL. And I am completely lost. because my files in the folder were uploaded already besides the folders like wp-admin or wp-content. but when I try to type in a browser mydomainname.com/foldername (you understand what I mean i hope), I get nothing. So I don’t know what to do. And those pages are html pages that I want to upload so that they could be seen exactly as in my Kompozer and not as my other wordpress pages. This was fantastic!! I barely know what I’m doing and had updated plugins and then received a parse error. Through these instructions I have my website back!! Thanks! This is horrendous advice. Why on earth would recommend anyone use FTP to upload files to their website? The gods invented SFTP for a reason. Use that instead. Our audiences are beginners and we didn’t want to confuse them with the jargon. We feel that many FTP clients support FTP over TLS and many hosting providers support it as well. But you are right, we should have mentioned that users should select SFTP when available. We have updated the article to let users know that it’s best to use SFTP when possible. hi i am having a parse error in my site i tried using filezilla and followed your steps but i couldn’t login into the server please help me and save my life team i am in very critical situation. You can try accessing files using File Manager in cPanel dashboard. My blog vanished when I updated one of the plugins. I recently built WordPress site on xampp server for my company which have its own data center.They want the site to be hosted on windows server 2012 in this data center by buying domain name from ISP.So,can you please guide me how to do this.Thanks in advance and a really appreciation all your tutorials and efforts. I would like to ask. is it possible to import an entire folder from ftp server to wordpress instead of importing a single file? If so, how is this possible? Thank you. how to upload local server wordpress files to live server??? can you upload some video? thanks for this excellent video, I would like to ask you about videos, what happened if you have a video that you cannot uploaded from wordpress and instead you need to use FTP (where is the Media folder) to drop this file? You can upload it to /wp-content/uploads/ folder. However, the video will not appear in your WordPress media library inside admin area. You can still manually add the video by entering its URL. I love you so much! I really appreciate your help, you just saved my life. Your voice is clear. You delivery, for me. a beginner, was so fast -along with your speed of mouse movement, your presentation became- because of the speed – was impossible for me to follow. Is there a way for me to slow down your Delivery? Hi, I locked myself out of my site after I changed the url’s when attempting to move from ,wp, sub directory to public_html for live site. If I have a back-up of before I altered the home and site url’s can I upload it using ftp, or do I need to make changes in phpmyadmin first? Thankyou in advance. So everything is perfect when i use the Edit tool but as soon as I publish, there are no spaces between paragraphs. I tried looking for the Editor in Appearance but my WP Admin page does not have that feature. How do I fix this? If you are adding text to a PHP or HTML file, then you need to wrap it around paragraph tag <p&gt and </p> tags. Hello this is a really great tutorial; but i have a question, i dont have much experience, so im trying to set the winSCP, but it gave me this error message conecting to (my host name) acces denied, and ask me to put the pasword again, if some one can help me i will be really happy. I installed and connected filezilla to my site, but in Remote site section appear nothing…. What can I do? In order do use FTP do i have to download one of the FTP clients? Yes. See our list of best FTP clients. I’m one of those people trying to do all by themselves, and got locked out by my site. Same here, I’m doing my own business set up. I love this plug-in! Once you understand the structure of WordPress, it’s a blast to use. I love their plug-ins and the ease of the design. I am yet to buy the domain from any hosting provider. I am new to WP. How to configure filezilla for hostname: ***.worpress.com? is it possible? Please help me. After editing the functions.php of my site, this appeared: Parse error: syntax error, unexpected ‘<' in /home/carljohn/public_html/wp/wp-content/themes/blog-start/functions.php on line 83. How will I resolve this problem? Please see our guide on how to fix syntax error in WordPress. Hmm… So I’m new at this whole FTP programs thing.. And as I have to completely change and update my company’s website, I wanted to use the domain but switch everything else to WordPress… Do you have any tutorial about this switch? If you are sure that you are using WordPress.org, then please ask your hosting provider for help. Blah, blah, blah. 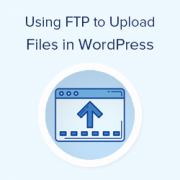 What the heck is the WordPress FTP server? I know how to use ftp but I don’t know the wordpress server?!?! Your WordPress server is the computer where your WordPress site is stored by your web hosting company. An FTP client allows you to connect to that computer and upload or download files. Please contact your web hosting service provider for your FTP login credentials. Thank You!! This was very useful info & saved a lot of time in restoring the corrupt php file and now my website is up and running again…. saved me a great amount of time in redoing hell lot of development……. I appreciate you. I am a new webmaster, and was sent Login Info for WordPress and the FTP. There was also a link and so I clicked on the link and it sent me to a login dialog box. I entered the login info and password then nothing happened. Why??? Great video. The issue I have is I wanted to upload a video file into the media folder using FTP, I followed these steps and could not locate de media folder, how can I do tha? Can you tell me if I can use wordpress.org as a store? I have a dropship company that can give me FTP files of their products and upload to a website. I have to build a new website so maybe wordpress.org?? Yes you can use WordPress to build your website. Thank you so much! This post was a life saver. I have purchased my domain from wordpress itself. Now, I am trying to migrate from wordpress.com to wordpress.org. I do not find any control panel in my wordpress account. How do I do it? I am already going through your tutorial on https://www.wpbeginner.com/how-to-install-wordpress/#installftp, but am not sure which is suitable. Please suggest. Thank you for this. I was locked out of my site yesterday when I edited my functions.php file. After freaking out, taking a deep breath (as instructed by one of your articles), laughing from nervousness, trying a few things and eventually taking time of to clear my head, I finally managed. Took me a couple of minutes. What am I doing wrong? Both Filezilla and Cyberduck say they cannot connect to server. I ran a diagnosis and there is not an issue with connect to the internet. I listed hostgator as my host. 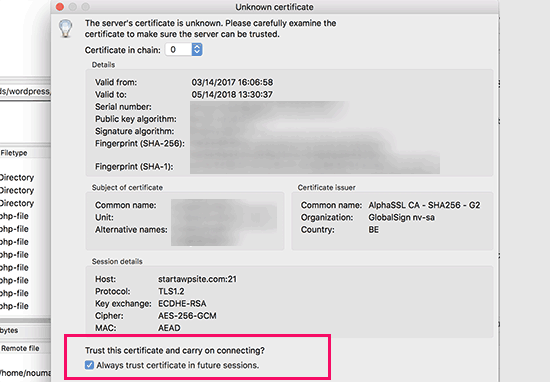 Please recheck the credentials you are using to log into your FTP server. If you are unsure, contact your hosting provider. Thank you for your help! This and related posts helped me get through my coding error without freaking out too much. For some reason, my website is still messed up (I didn’t have the functions.php saved, so I just removed the bad code and saved the rest to access my website as admin), but at least it’s not entirely inaccessible! I locked myself out of my WordPress after I put a code snippet to the function.php file. I know where the error is. I do not have a backup of my files of my website (my computer recently crashed). Can I still enter the function.php somehow and remove the code? Or does my hosting company have access to those files? 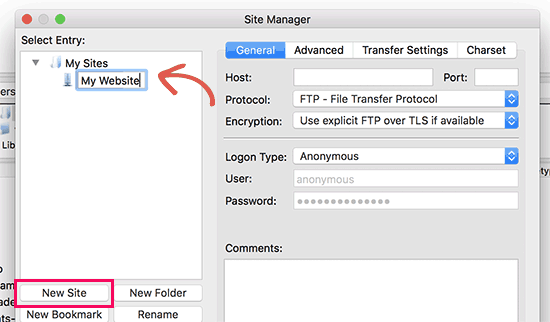 You can still access your site using an FTP client. After connecting to your site navigate to /wp-content/your-theme-folder/functions.php file and edit it. I downloaded Filezilla and it came with a browser hijacker. Do not download it. host name, username, password and port number as seen on the filezilla platform? These values will be provided by your web hosting provider when you set up your account. You can also get these details from your web hosting control panel. The hostname is your server’s location, and username and password are your FTP login credentials. What are the host ftp, username, password and port number to be used with Word Press. Without these information, FileZilla can not transfer your files. Large file transfer presents a problem. Usually the server will cut off the transfer if your files would take to long time to transfer. To reduce the size of your file, you have to apply some file compressor program before you use FTP. For example the video files are usually very large and need to be compressed before you can use FTP to transfer them. You are not supposed to be editing the core WordPress files. You can edit your posts and pages using WordPress admin area. Or if you want to change something in your theme then you can do that in Appearance -> Customize section. If you still must edit the files using FTP then first make sure that you have a complete backup of your WordPress site. I have been looking for an hour for an answer..
What file in FileZilla holds the pages that are installed on my site? I want to edit something on a page that I can’t seem to edit in my wp editor. So I dl’d FileZilla but I’m confused about the ‘host’. All I did was hop onto WordPress.com and started my blog, but I don’t have any of the initial emails because I did it a while ago. Is wordpress my host? Or are people using other parties to “host” their sites? I second this – can I edit using FTP if we’re just using the free wordpress site? I am still confused. I logged into FTP but now I am trying to fix the problem. What happened is I tried to put an ad from google adsense into a different sidebar by putting code into my website. That created a syntax error and now I am locked out. This website says you can delete a file and hopefully you saved the original. But I didn’t save an original so what do I do. How do I find the spot where I put the code and be able to just delete that select area out so I can get my site back? The video doesn’t say that. Wampserver is used to test WordPress on your local windows PC. You do not really need an FTP client to copy paste files in WampServer. You can just go to the /www/ directory in WAMP install folder and paste WordPress files there. 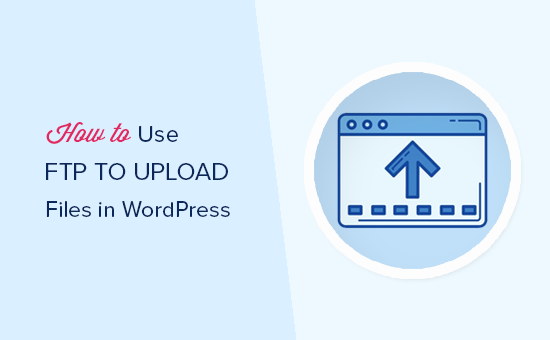 See our guide on how to install WordPress using WAMP.